Coaching AppThe coach’s coach, right at your fingertips. Player ImpactResources and stories of the impact you can make. Speaking/TrainingDon’t wish for it. Work for it. ContactAthlete’s Impact wants to help. © 2019 Athlete's Impact. All Rights Reserved. Men look up to the guys who can take a hit and keep going. Drawing from the lives of Moses, David, Joseph, Jonah, and other biblical men who faced the worst, Evans pulls men out of their brokenness and declares, “No more!” No more falling short of being the man God desires you to be for any reason. Evans shows that the struggles faced yesterday and today are the very same tools God is using to make us better men for tomorrow. 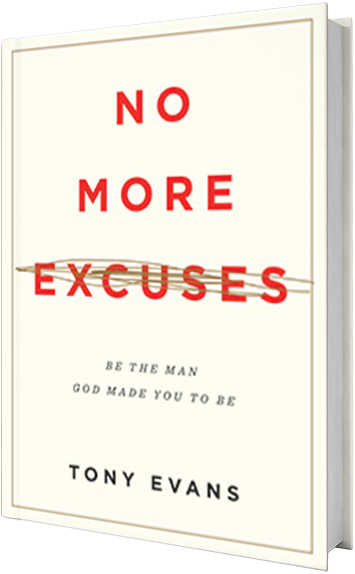 GET YOUR COPY OF NO MORE EXCUSES TODAY! Discounts are available on purchases of 20 or more copies for your team or school. Bulk discounts are applied at checkout in the TonyEvans.org online store. You can also call 800-800-3222 to order. Dive deeper with social and email. Want to stay ahead of the game? Follow us on social media or sign up for our email list to be the first to know about new features, special events, and one-time offers. © 2017 Athlete's Impact. All Rights Reserved.